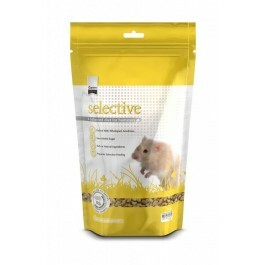 Science Selective food is recommended by vets and is a nutritionally complete and balanced diet for hamsters. Selective is rich in tasty wholegrain goodness. Linseed, an excellent natural source of Omega 3 & 6, is also added to ensure coats stay glossy and in good condition. High levels of sugar in a hamster’s diet can lead to overeating and obesity. It can also lead to dental problems too. Science Selective Hamster has no added sugars. Suitable for all breeds including dwarf hamsters. No artificial colours or additives. If your hamsters are used to a sugary diet, you may find it takes them a while to change, but persevere as it will help to benefit their health in the long term.